Boy Scouts of America - Official Boy Scout of America website. Patriots' Path Council - Troop 12's official council website. Raritan Valley District - Troop 12's official district website. The "Be A Scout" Zone - This great tool can be used to help introduce your friends to Scouting. It includes an interactive postcard generator, a troop locator, online games, and even information for parents. Activities - Learn more about the kinds of things that Scouts do—and learn to do them better—with the resources in this section. Events - Information about special events in Scouting, including the national Scout jamboree, JOTA and conferences. Opportunities - A number of opportunities such as training courses, summer jobs, and special programs are available to Boy Scouts. Scout Stuff - The BSA Supply Division website offers information about camping equipment, uniforms, handbooks, and other essential Scouting merchandise. 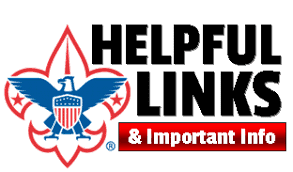 These informational resources are provided to assist you in your role as a troop member - whether as a Scout or an adult leader.